Juan Marcos Mirande (-55) of Argentine has signed on! Marcos will be D1/g6 (same classification as Miguel) to start and we'll see how it goes from there. 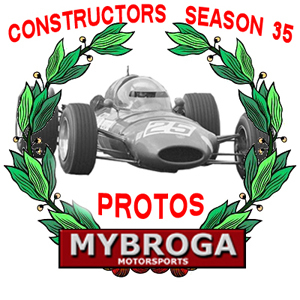 Marcos hopes to get a full season in, so if you D1/TL's know you'll be a driver short, do contact him! ¿Qué es eso? Primero de todo tenemos Farina y entonces Cendejas, Lima, Silva, Palud, y ahora Mirande. ¿En serio? ¡Es la reconquista, verdad! A hearty welcome to you, Marcos! And I promise to do more 1967x races soon. Welcome Marcos , nice to see you here. Welcome aboard Marcos!!! Abrazo grande. Welcome Marcos, great to have you in oAo! I think I typed the same thing the guy before me did..... yup, I did. Very uninventive of me. Are you here to steal rule ideas really? That is good news. Let the Capitan team take care of the money by now. You just take care of the car. Im also glad you are going to be on track. Hello again, thanks for the welcome messages!! I hope to be present in many races of oAo. Races are a little bit late for me, but I'll do an effort (and "negotiate" at home, hehe). A bit late to the party, but welcome aboard the good ship oAo Marcos. Hope to see you in Bathurst. Hello Marcos, Marcos is a great person and a very good pilot, he is the administrator of Mybroga, a tireless fighter to take the GPL to the top, it makes me very happy that you are here with us Marcos, this league is really very demanding, here you are the best, a very big challenge for us, but an opportunity to learn from the best pilots, we see ourselves on track. Gpl in the veins !!!! Edited by Miguel Palud, 01 March 2019 - 05:30 AM.